Testing SO Ethiopia Suke Quto espresso. I love testing new espresso. 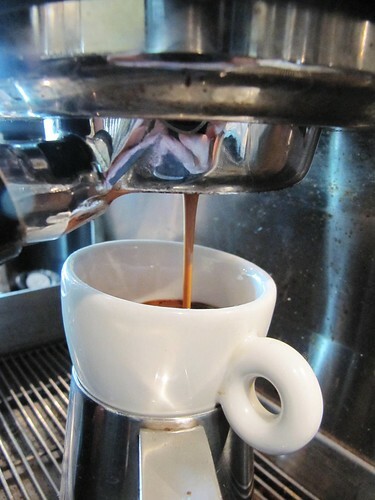 I also love testing whether or not something will work as a Single Origin espresso or as a component for espresso. Today I had some extra Guji Suke Quto from last night’s tasting class. Now I’ve used this as a component of an espresso, but I haven’t really tried it as a Single Origin. Golden opportunity. This allowed me the opportunity to test without roasting an entire new batch, and if the roast level I used for the coffee will work or not. I’m pretty systematic about my testing. I know what range of grind to target, so I pick a midpoint and start from there. I keep the Synesso at the temperature set for the current espresso (199 F). No need to change until after I taste… but that’s still a bit away. First I’m just watching for flow. It’s too fast. I’ll give it a taste. Sip. Mild citrus, hint of nut. … good, but it seems like it’s lacking something. It’s not a one dimensional coffee. I know there’s more there. I just have to find it. I always pull a second one so I know if it was a fluke or not, and it looks the same. First sip – Candied ginger, sweet citrus and jasmine. Second sip – warm spice, a touch of bergamot, honey sweetness. Finish – dark honey to maple sweetness, restrained citrus, hint of spice. I’d say, “Yes.” But it’s not that simple.